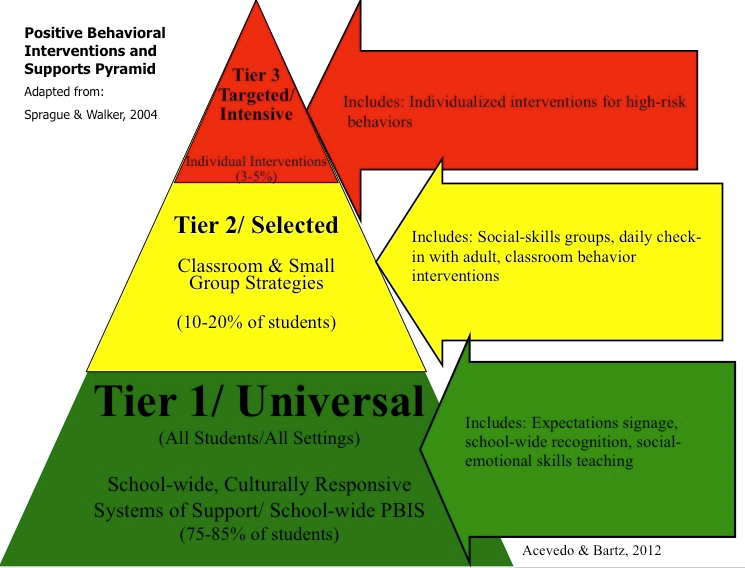 Tier I of the PBIS model, universal or primary approaches that are preventative in nature are put into place (Sugai & Homer, 2002). These approaches are for all students, staff, and settings and include the development of school-wide expectations, a behavioral matrix, and reinforcement systems to reward desired social behavior. Outcomes, systems, data, and practices are continually evaluated when providing universal supports (Center on Positive Behavioral Intervention and Support). Academy Day 1 PowerPoint (updated 9/10/2018) includes an overview of multi-tiered system of support, West Virginia data, description of the Tiered Fidelity Inventory, the importance of teaming and creating school wide behavior expectations. Academy Day 2 PowerPoint (updated 8/24/2017) includes information about effective discipline procedures (definitions, responses and forms), using your data, the importance of teaching behavior, and how to create your acknowledgement and feedback system. Academy Day 3 PowerPoint (updated 8/24/2017) includes ideas for gaining buy-in from faculty, students and families, how to create an implementation schedule, guidance on what to do after the training and additional resources.